I remember when and why I bought my first powerbank. It was a day after I got lost on my way to a job interview. From a new haircut, updated resume, and pressed shirt and pants, I thought I’d done everything I needed to prepare for this big day. The one thing I forgot was to charge my phone the night before. The job was in another city about 30 minutes away, and I had to rely on my phone’s GPS to get there. Needless to say, it my phone croaked about halfway to the interview and I had to wing it the rest of the way there. I didn’t’ get the job, but I did purchase a power bank charger so this wouldn’t happen again. I thought I was so slick with my gas station powerbank. If I kept it charged, it would prevent my phone from going dead phone while I traveled. I loved this device so much that I bragged about it… perhaps a bit too much. Somewhere along the way, my wife commandeered the powerbank as her own. Apparently, she “needs it more than me” to keep her electronic vape unit charged. I didn’t bother to argue about it. Happy wife, happy life, right? What I really need is this three-in-one fast charging wireless powerbank carried by Solid Signal. This powerbank has everything to keep my family’s devices charged. At 10,000mAh, it stores enough power to fully charge a device 3.5 times before the powerbank needs to be recharged, itself. It’s most exciting feature is its Qi wireless charging capability. When I set my phone down atop this device, it automatically turns on to wirelessly charge it without any type of wire connector. 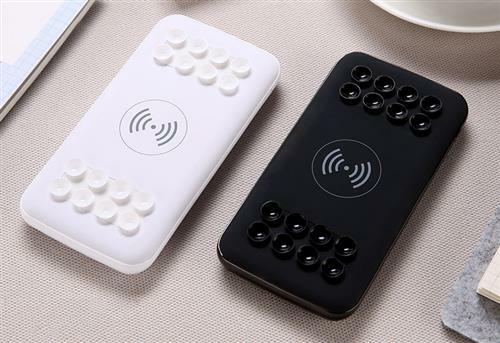 This unique combination of useful features could make this the best power bank for you and your family. With three kids, a wife, and myself all having phones and devices, it has become a useful tool at Casa del Buckler. We “share” our powerbanks, after all. With three USB charge ports and Qi wirelessly charging, no Buckler gets left out when it’s time to charge up. The suction cups on this unique charger remind me of a toy from my youth. It was called “Suckerman,” and it was made by Mattel, a giant among toymakers back in the 1970s. For those of you who aren’t quite as ancient as I am, Suckerman was a rubber monster-like toy that had suction cups on its body, tentacles, and legs. The fun of Suckerman was pretty simple: you throw this rubber monster against any hard surface, such as walls, windows, and doors, and it would stick there. My cousin Johnny and I had a blast with our twin Suckermen toys we got as holiday gifts. This versatile power bank is the charging device of the future. It’s ideal for families or individuals who own multiple phones and/or devices. That’s why Solid Signal carries these powerbanks. With all the charging options it offers, this could be the best portable charger for anyone who doesn’t want a dead cellphone at the worst possible time. (Like running out of juice when you’re driving to a job interview, for example.) Are you interested in this powerbank? If you have any questions about it, call Solid Signal’s product reps at 877.312.4547.